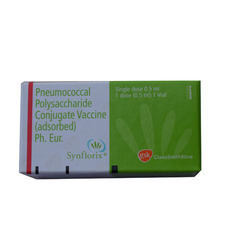 Prominent & Leading Wholesaler from Ahmedabad, we offer synflorix polysaccharide pneumococcal vaccine and pneumo 23 polysaccharide pneumococcal vaccine. It is a capsular polysaccharide vaccine against disease caused by 23 of the most common serotypes of Streptococcus pneumoniae (pneumococcus). S. pneumoniae causes invasive bacterial infections including primary bacterial pneumonia, meningitis, and bacteremia. Invasive disease is most common in the very young, the elderly and in certain specific groups at high risk, such as individuals with functional or anatomic asplenia and congenital or acquired immune deficiency. Given that not every case of invasive pneumococcal disease would have had cultures taken before starting antibiotics, these estimates likely represent the minimum incidence rates. Population surveillance data from 9 selected health units across Canada show that the age-specific incidence of invasive pneumococcal disease is greatest in children <5 years of age (55.3 cases per 100,000) and in persons 65 years of age (46.4 cases per 100,000). Ninety-four percent of cases were caused by serotypes contained in the 23-valent pneumococcal vaccine. Other Canada-wide estimates suggest that approximately 90% of cases of pneumococcal bacteremia and meningitis are caused by these 23 types. Penicillin-resistant strains generally appear in serotypes included in the vaccine and have become more common in Canada, increasing from 2.5% in 1991 to 11.3% in 1998. The six serotypes that most often cause drug-resistant invasive pneumococcal infection are included in this vaccine. The overall case fatality rate from invasive pneumococcal disease is 11% increasing to 20% for those in the 65 age group. Efficacy of pneumococcal polysaccharide vaccine is in the range of 50 to 80% among the elderly and in specific patient groups such as those with diabetes mellitus, anatomic or physiologic asplenia, congestive heart failure or chronic pulmonary disease. Pneumococcal polysaccharide vaccine is not indicated for children 2 years of age; however, it may broaden serotype coverage for high-risk children 2 years of age. Although the duration of immunity is not precisely known, serotype -specific antibody levels appear to decline after 5 to 10 years, decreasing more rapidly in some groups than others. In clinical studies involving more than 1,000 volunteers, serum capsular polysaccharide antibodies start to increase 10 to 15 days following immunization. Clinical trials have shown that healthy adults develop excellent antibody responses following pneumococcal vaccination 80% or more of subjects develop at least a two-fold rise in antibody levels, inducing IgG and IgM antibodies in individuals immunized intramuscularly. 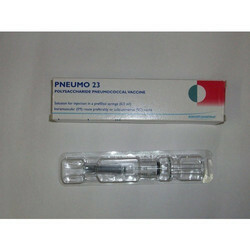 It is indicated in persons two years of age or older for the prevention of invasive infection, such as bacteremia, pneumonia or meningitis, caused by the serotypes of pneumococci contained in the vaccine. A single dose of pneumococcal polysaccharide vaccine is recommended for all individuals 65 years of age including those with unknown vaccination histories.